Vegetable peelers were one of the few kitchen tools I mastered, after the knife, spoon, and fork. And thank goodness! One of the simplest kitchen tools is also the most effective. A good peeler is essential when working with fresh fruit or vegetables. Peelers make a chef’s life easier. You learn to peel with them safely and efficiently, and the peeler rewards you with a clean shave on every fruit or veggie it touched. Don’t ever use a paring knife to peel your product. It’s unnecessary, and you’re risking cutting yourself for no good reason. A veggie peeler is built for the task at hand. and much easier if you use a tool Veggie peelers remove really thin slices of the skin which leads to more rational consumption. 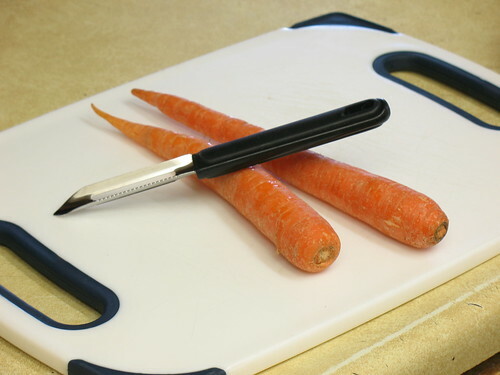 Vegetable peelers can be also used for slicing when you want to get equal and paper-thin vegetable slices. For example, it’s applicable for potato chips and eggplant rolls. 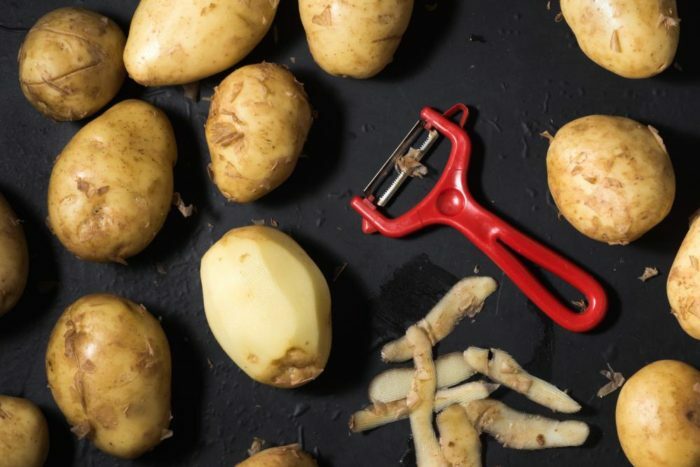 The first thing to know about vegetable peelers is — you need more than one. 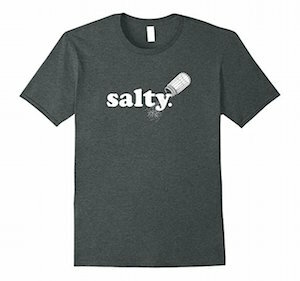 They’re not very expensive, and that means you should get a couple of them. 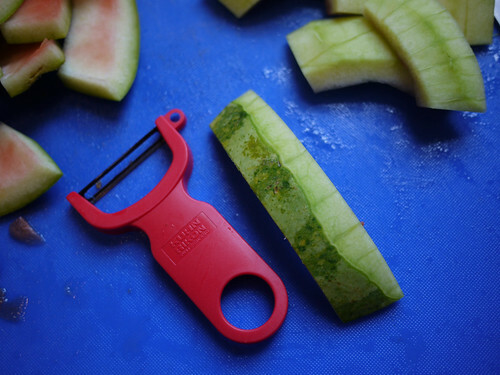 What your chef friends haven’t told you is that one peeler is better for the large object, like (see below) rinds for a watermelon. Other peelers are better for smaller objects, such as carrots. These are also used to slice perfect little garnishes for cocktails and other delights. When choosing a vegetable peeler the shape is the first thing to look at. There are two basic styles available: vertical bladed peelers, where the blade is parallel to the handle, and yoke-shape peelers, where the blade is perpendicular to the handle. I prefer Y-shape peelers as they are versatile for different shape vegetables and fruits, while vertical bladed peelers are more suitable for longer veggies like cucumbers and carrots. Different peelers have different blades, and that’s not just a random thing. The different blade has a purpose and function. You may think this is a simple feature, but don’t overlook it. Think about your favorite veggie dish. What kinds of vegetables will you peel? Look for a peeler with a swiveling blade as it is more convenient to work with and it follows the shape of the vegetable being peeled. The edge of the blade can be either straight or serrated. A serrated blade is good for softer vegetables and fruits such as tomatoes and kiwi. If you are left-handed, make sure the peeler has a two-sided blade which is universal for both right-handers and left-handers. If you consider buying a peeler with a ceramic blade, you need to know that ceramic keeps edge longer, it doesn’t produce rust and doesn’t react with acidic fruits like apples and tomatoes. However, ceramic is easy to damage and quite expensive. It’s okay to be a klutz. I can’t dance without stepping on my own feet, as well as yours. Stop cutting yourself with your knives or peelers. These food grade gloves can prevent injury when you’re working with sharp knives. Handles also deserve special attention. Plastic is the best choice since it’s light and doesn’t carry bacteria. Make sure that the surface is even and without roughness. It’s good if a peeler has a non-slip handle. 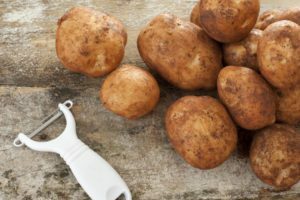 The next thing to consider when choosing a vegetable peeler is cost. There really is very little need to spent more than $20 unless you plan to use a peeler all day, ever day. But no matter what, you should have more than one peeler in your kitchen. I highly recommend buying a few inexpensive ones to try out for your next meal. This kitchen tool will save you time and effort for the rest of your life.